A new study published in Nature describes the creation of a new sensor which will allow us to know when our liquid food has gone bad – and it may not be long until we can all 3D print bottle caps with these sensors at home. UC Berkeley engineers, in collaboration with colleagues at Taiwan’s National Chiao Tung University, are taking 3D printing one step further, to include electronic sensors. For their first application, they’ve developed a smart cap for milk that lets users know when the milk is no longer good for consumption. The electrical circuit can in turn detect changes in levels of bacteria in the milk – all you have to do is turn the container upside down to make sure the liquid comes in contact with the cap. 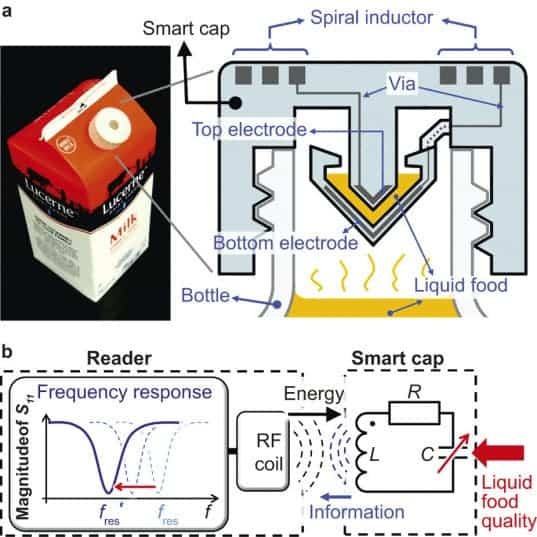 The way this sensor is designed, you could apply it to all liquid foods. It could even warn users that the food is nearing its expiration date – it may usher in what some would call “smart food”.